I have to say I love crafting and I love upcycling. It’s a great thing, when I can combine the two the learn to reuse plastic bottles or other things we usually throw away. So, here I came up a few nice projects on repurposing plastic bottles. That is one more problems solved in my house. I used to store all my recipes in a notebook. When I open it up to see the ingredients, I spill things over the pages and the recipe book gets untidy and messy. I hope you do better than I in this respect. But I have several recipes I use all the time. So, here is the repurposed plastic bottle and crocheting project to solve my problem. 1. Cut out a piece of smooth plastic our of the plastic bottle. 2. Make holes on the edges with a pricker. 3. Use some nice yarn and crocheting hook to crochet the thing around from three sides. 4. Measure the size of your frame pocket and print out or write out your recipes. (Do two of them for one frame). 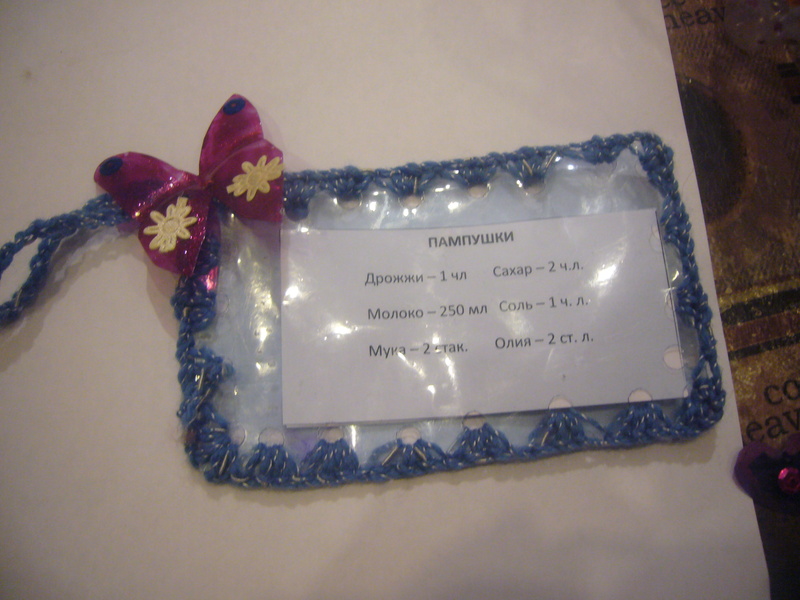 5. insert the recipes inside the frame and crochet the last side. 6. Crochet a chain to hang the frame and decorate it, if you wish to. BTW, the butterfly is also made out of the plastic bottle. I think, this way my recipes look nice. They are always right before my eyes, so I do not even have to get the recipe book out. And, I;ve reused some of the plastic bottles decorating my home. All you need is a little crocheting skill and some imagination for this easy plastic bottle upcycling project. This entry was posted in Crafting Tutorials, Crocheting and tagged busy moms, cooking tips, crafting, crafts, creativity, crochet, crocheting, DIY, easy crafts, housekeeping, how to reuse plastic bottles, recipes, repurposing, reuse plastic bottle, tips for moms, upcycling, upcycling plastic bottles. Bookmark the permalink.